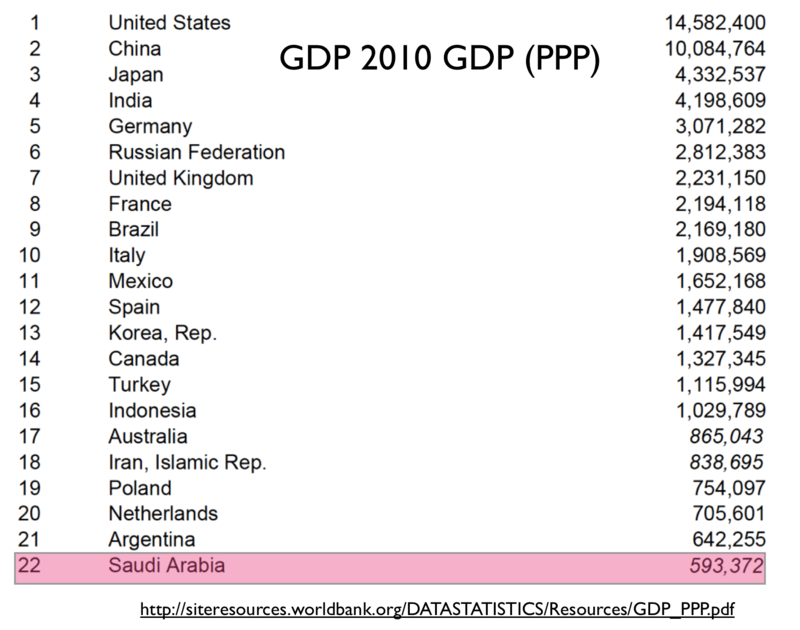 How Big Is the Saudi Economy? 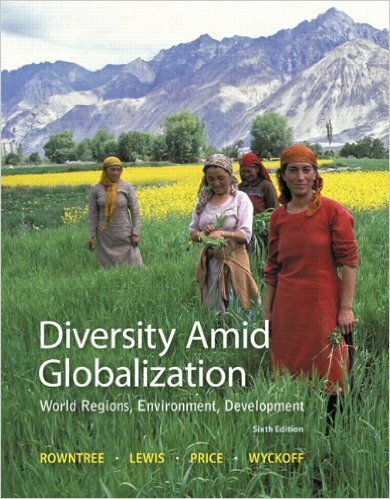 Does the World Bank Know? 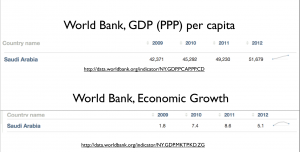 Delayed rebasing, however, is by no means the only reason why official economic data can be misleading, especially for relatively poor countries with ineffective information gathering capabilities or high levels of corruption. For this reason, I always caution my students to regard such measurements as Gross Domestic Product (GDP) with some skepticism. But I also tell them to pay close attention to such figures nevertheless, as in most cases they are the best economic representations that we have. 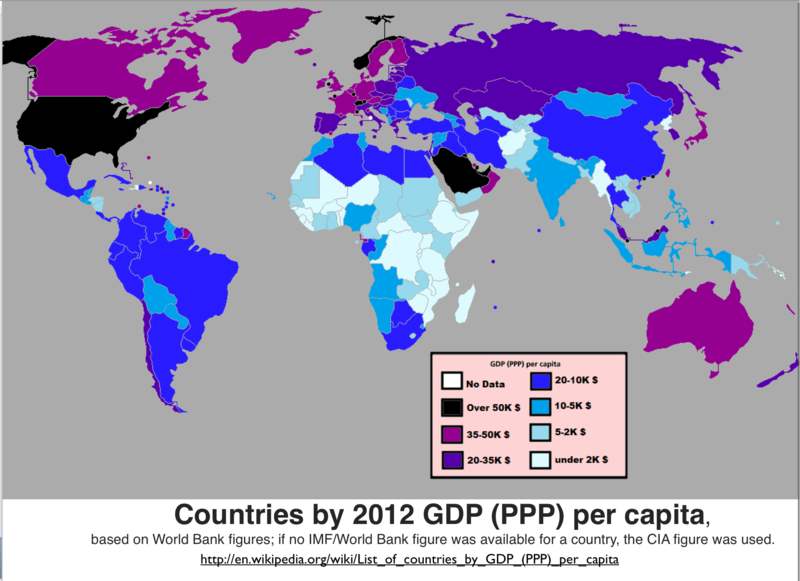 For the same reason, I try to keep rough track of the global distribution of per capita GDP. Doing so, however, can be a challenge, as the numbers often differ from source to source and they can jump erratically from year to year. 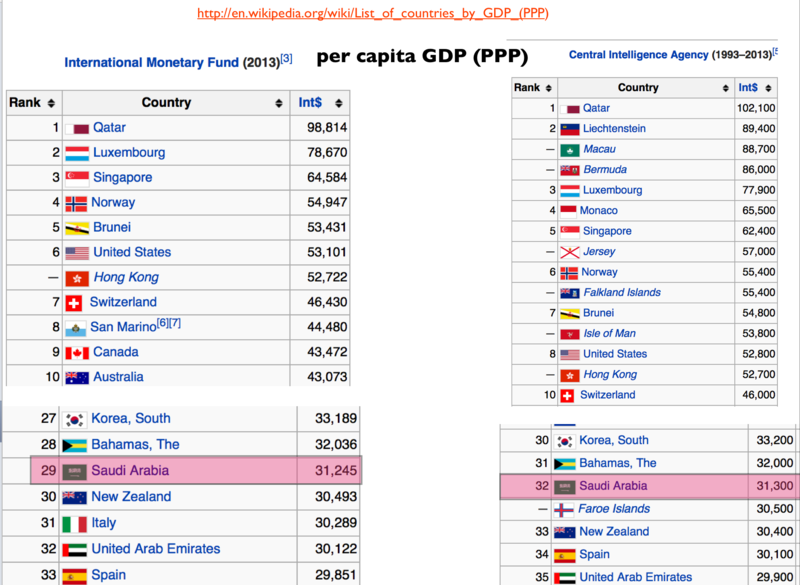 Consider Saudi Arabia. 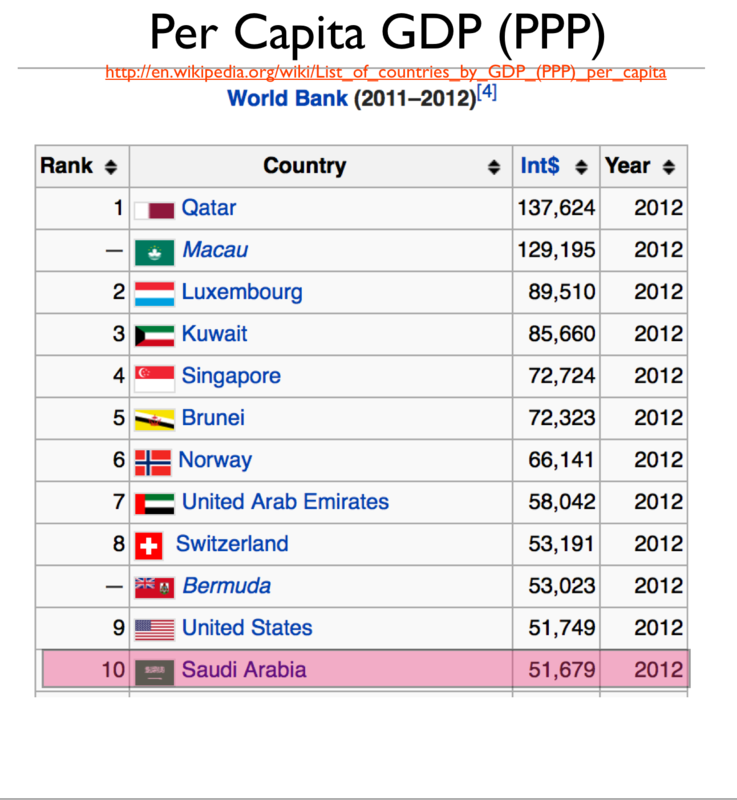 Saudi Arabia, with its extraordinary fossil-fuel deposits, ranks as a rich country in all measurement schemes. 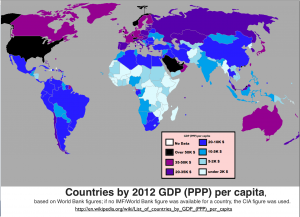 But its economy does not extend very far beyond the oil sector, and as a result it is not generally counted as one of the richest countries in the world on the basis of the most common measurement: per capita GDP as assessed though Purchasing Power Parity (PPP). 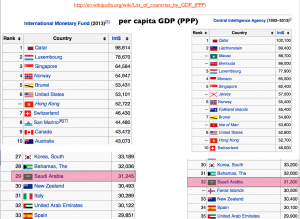 In their most recent tabulations, for example, both the International Monetary Fund and the U.S. CIA peg Saudi per capita GDP at around $31,000. 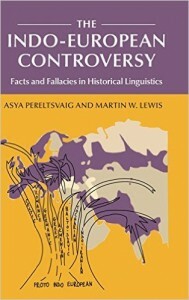 Although this is a high figure in global comparative terms, it still lags well behind that of the United States, which comes in at around $53,000. 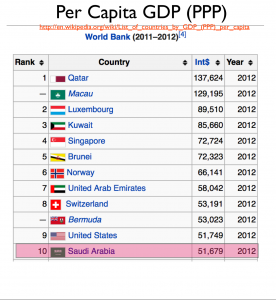 The World Bank, however, places Saudi Arabia in the rarified league of countries with per capita GDP (PPP) figures in excess of $50,000. 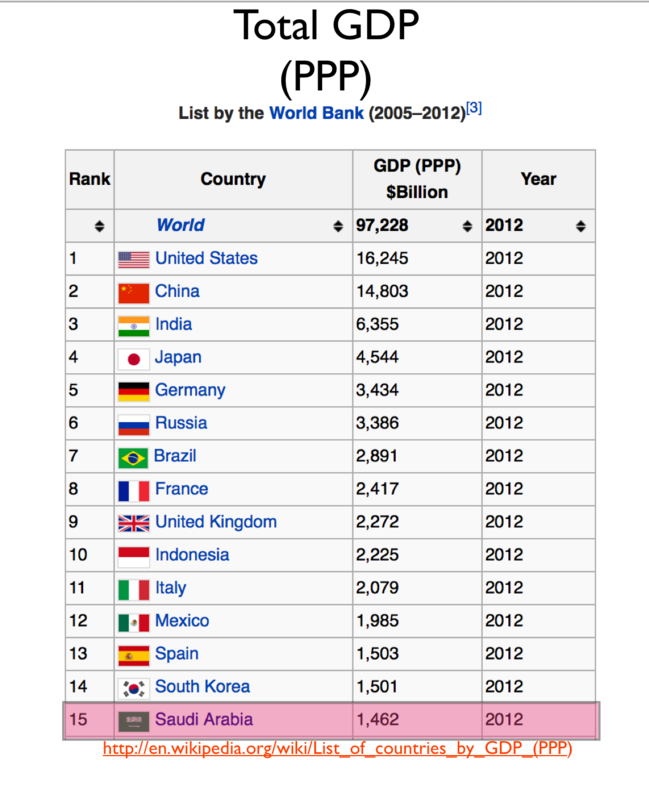 It would seem that the World Bank’s aberrant estimation of the Saudi economy is of relatively recent derivation. 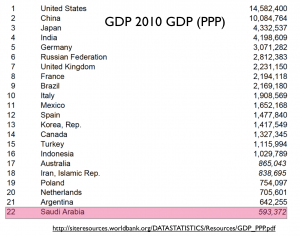 The Bank (2012) now estimates the total size of the Saudi economy at $1,462 billion, yet as recently as 2010—if the data table posted to the left is accurate—it had assessed it instead at a mere $593 billion. 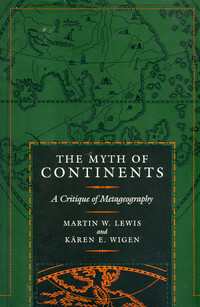 As of 2013, both the IMF and the CIA provide figures that are closer to the World Bank’s earlier estimation than to its current figure ($937 billion US and $928 billion respectively). 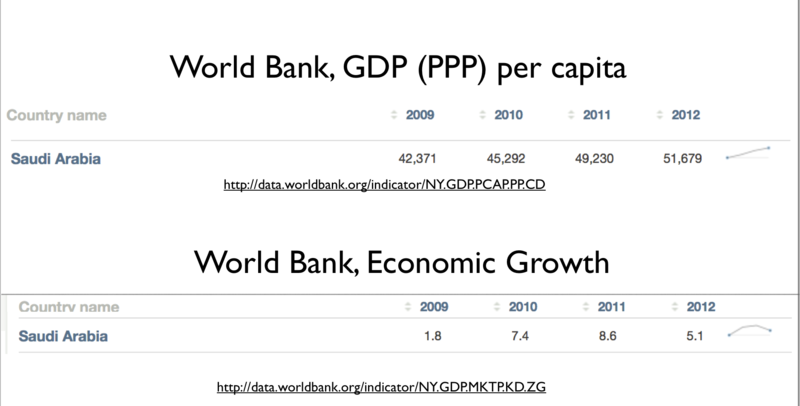 The World Bank’s own on-line data tables, snippets of which are posted here, do not indicate any major shifts in the Saudi economy since 2009. 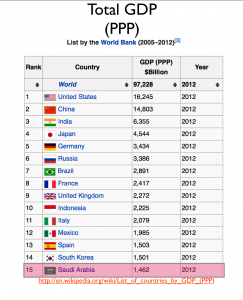 Due to time limitation, I have not been able to investigate in any detail the World Bank’s unusual and seemingly discrepant estimation of the size of the Saudi economy. Quick internet searches do not indicate any recalibrations or data anomalies. 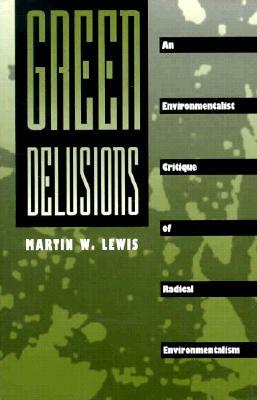 In conclusion, I can only reiterative my warning: it is prudent to regard all country-level economic data with a healthy dose of skepticism.